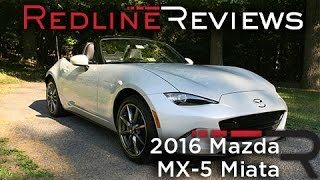 Year 2014 glorified the arena for those who witnessed all new Mazda MX-5 2016, a model creating benchmarks since 1989. 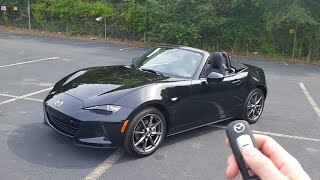 Since its very introduction Mazda brought in numerous updates in design and power of the model and this fourth generation model commendably proved their intentions and capability to compete with moving time. Let us have a closer look and learn more about this new release. With the very first step inside the interior of Mazda MX-5 2016 interior you’ll notice a few appreciable changes. The first in this category with the very entrance is in the door panel, which now incorporates body-matching panels. Apart the dashboard still carries the legacy with soft-touch piece replacing the plastic inserts in instrument panel, while the circular knobs and A/C vents remain the same as in its predecessor. With the introduction of modern touchscreen, buttons and switches previously mounted over center stack finds another home, in turn making the center-stack a cleaner work. Steering wheel remains untouched with the traditional three-spoke design. However you might feel the model smaller but interior offers you enough space and lower seating position. Exterior of Mazda MX-5 2016 too received rounds of changes, beginning with the front fascia; larger grille in the previous model gets a replacement by a reworked basic grille, holding resemblance with the original model we saw back in time. LED headlights for this MX-5 2016 model gets up-slanting teardrop shape making this classy and different. 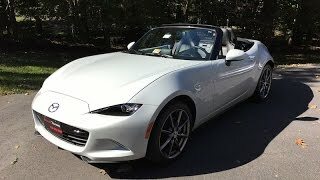 Marching towards the rear fascia of Mazda MX-5 2016 bumper gets a taller look while new pointy trunk lid spoiler brings changes in models rear look. Adding to the glory are rounded taillights and turn signals portraying sharper and crispier look. 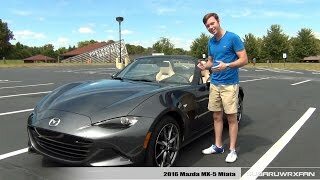 In al with the sloppy hood and muscular fenders we found the entire exterior of Mazda MX-5 2016 featuring an all new sportier profile than before. Mazda has released the power specifications for the U.S model of Mazda MX-5 2016. Model will get its power through a 2.0 Liter four cylinders engine. Mazda MX-5 with its new engine will be delivering a total of 155 hp and 200 nm torque paired to either 6 speed manual transmission or 6 speed automatic. While for the customers in Japan with 1.5 Liter four cylinder engine delivering 129 hp and 150 nm torque, it pairs to only six speed manual transmission.